The drop spindle is maple, as I recall, and was purchased at Gemini Fibres. 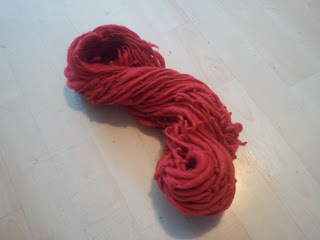 They had a lot of beautiful merino fibre for sale and I picked up some crimson for my premiere project. 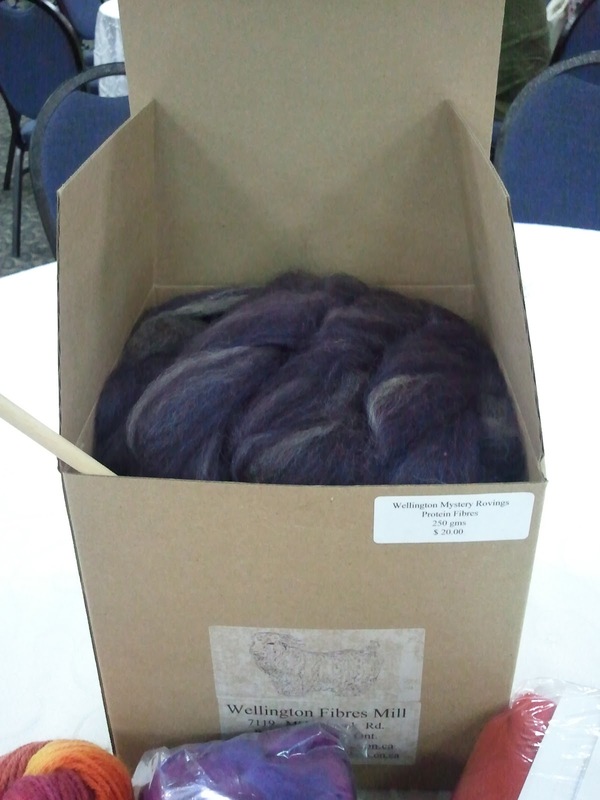 In addition, I got some roving from Linda's Craftique and a mystery box from Wellington Fibres. 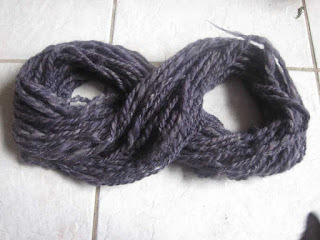 My first handspun was the crimson, and it's not the prettiest thing in the world, but I still love it. 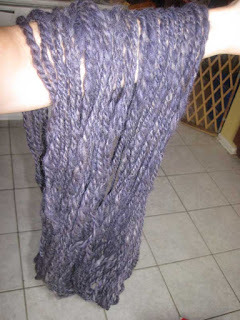 I called it, "Raggedy Anne". 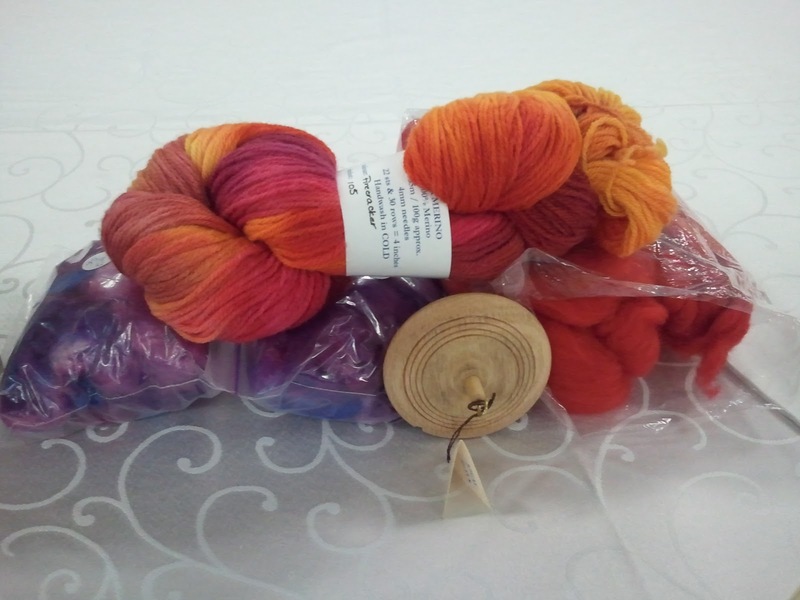 Once I was familiar with the concept of drop spinning, I started on the mystery box. I actually spun about 30g worth of roving before real life stepped in and told me to focus on kids and such. With Behemoth starting school and problems stemming there, my knitting had to take a back seat. It wasn't until yesterday, beginning of December, that I picked it up again, but in one day, I ended up spinning about 70g of roving in two 50g batches. 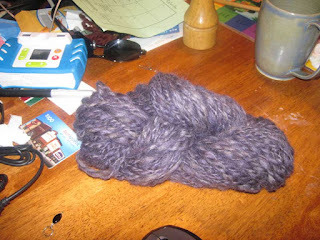 Pleased with the results, I actually double plied it and came up with an absolutely gorgeous skein of chunky yarn. It's actually sitting in the sink right now with some hot water and vinegar to set. I'll be taking it out in about ten minutes. It's gorgeous. It's soft and smushy and I think it has a bit of mohair in it, but not enough to piss me off. Because my favourite video game shut down, I sort of named it after an archetype as a kind of homage. It's called Nictus and I cannot wait to see the final product. Spinning is winning. I have a couple more projects in mind and really hope that they turn out well. 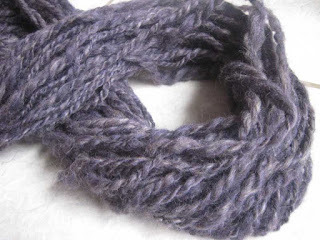 I've been inspired by my good friend Cindy and want to make gorgeous art yarns to knit up scarves and hats with. We'll see how it goes. Baby steps, and I think I'm doing well so far.